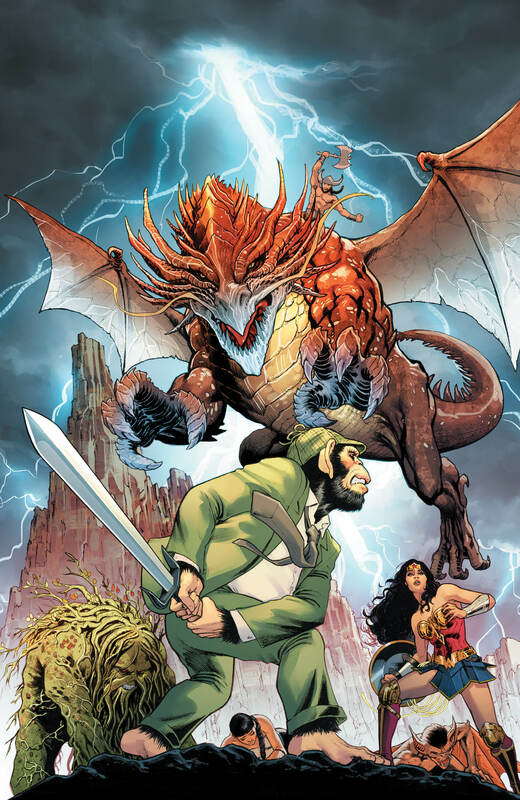 Justice League Dark #5 Review – AiPT! Following the mixed bag of its ‘Witching Hour’ storyline, Justice League Dark is barreling into the fray of a post magic cataclysm world with eyes on meaningful development for a main cast of characters, ramifications for the world at large, and more grandiose set pieces and twists and turns to come. Does the first issue back to whatever normalcy is for this kooky cast deliver? Mostly! More importantly, though, it remembers to have fun along the way. Wonder Woman’s magic act…banned! The DCU’s magical community collectively freaks out and forbids Wonder Woman and the JL Dark team from meddling in magic anymore after the disastrous events of the “Witching Hour” storyline. The team seeks refuge in the only place they can think of: Detective Chimp’s inherited, magical realm of Myrra–but not everyone is happy to bow to the new Nightmaster! So how can things get worse for the sorcery super-team? One word: dragons! That alone is a more inherently interesting and semi-lighthearted premise than the increasingly narrowly focused and overburdening ‘Witching Hour’ got with each issue. Luckily, the execution here is even better. Straddling the line between serious (because lest we forget this is Justice League Dark) and hilarious, the issue finds a great medium that allows our characters to grapple with the previous event’s ramifications on their own terms without overstaying their narrative welcome or wallowing in pity too much. Instead, we visit a morose Bobo in a touching and poignant funeral scene at the beginning of the book, reveling in Tynion IV’s characteristically verbose narration but honed to an effective, sharp degree and then pivot to a largely fun, wild, Army of Darkness-esque adventure in Myrra that brings real heart to a book sorely needing it. Bobo, Zee, Kurt, and Diana do their best to take down an army of skeletons and a dragon while trading quips like “When did it all go full George Romero?” in an unexpectedly hilarious, wild, and grisly-beautiful scene that showcases the best of the artistic team here as well as Tynion IV’s take on each character’s voice. It’s fun! My genuine surprise at that isn’t to say that the previous, overly serious or dark events leading to this were bad per se, but that they were overburdening. Now, however, balanced by a more serious fight that Constantine and Swamp Thing find themselves in, and this funnier, lighter affair in return, a real light shines through in the darkness that doesn’t wash away the shadows but instead highlights our heroes despite them. That’s great character work and plotting that makes us care more about them and their fates than any angry goddess or world ending cataclysm could do because it’s balanced against those things, not just wallowing in them. With the bait and switch of the opening scenes, beautiful and sharp depicting Bobo’s loss, we’re on track for a character-driven, earnest story about found family seeking to protect something that matters to them and owning up to their demons with fun thrown into the mix. I like that infinitely more than giant world ending events without humanity (chimp..man…ity?) and it seems Tynion IV may have set one up just to play around in the ashes for a bit. I can get on board with that. Especially when it looks as beautiful — seriously, check those two page spreads — as this one does. Justice League Dark redirects course slightly coming out of 'Witching Hour' with a darkly funny and poignant piece that puts characters first. It's infinitely more interesting than most of what's come before and genuinely excites for what's to come despite a few missteps. The balance here is fantastic -- pivoting from the harsh, morose opening to the funny light fight that takes up the majority of the issue feels earned and unexpectedly fitting. Daniel Sampere is a master of the minor detail! The art is fantastically intricate and expansive. Some of the trappings that held down previous JLD issues remain, watch out for that verbose narration even if it does feel a little more sensibly utilized this time around.